In the coastal area where the dead zone is, high levels of nutritional nitrates and phosphates help algae over-grow. When the algae finally die, they settle and are decomposed by aerobic respiring bacteria. As a result, dissolved oxygen in the water gets used up, and there is not enough oxygen for fish—making it a dead zone. Nitrates and phosphates get to the coast via the Mississippi River. Environmental Protection Agency testing has found that it’s the Upper Mississippi, above St. Louis, that contributes most of the nitrates and phosphates. These chemicals are routinely used to fertilize crops, especially nitrogen-greedy corn. Iowa. Students tested the samples with LaMotte water-testing TesTabs. 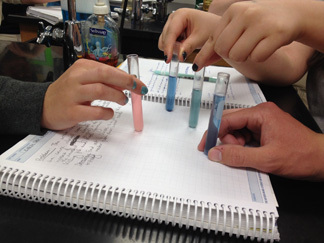 These tests use chemicals that change color: pink-orange for nitrates and blue for phosphates. The Prince of Peace ChemClub and all of the high school students collected water from creeks and run-off ditches all around Clinton to test on Earth Day. Nitrate was absent in drinking water, but detectable in waters running off into the river, ranging from 5 to 35 parts per million (ppm). 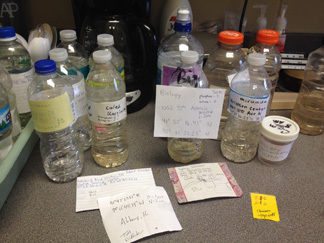 All water samples, including drinking water, had 1 to 4 ppm phosphate. Test results showed that the Clinton area is adding nitrates and phosphates to the Mississippi River. Students used Google Earth to get the GPS coordinates of their water sample sites, so the data could be reported to the IOWATER online database. 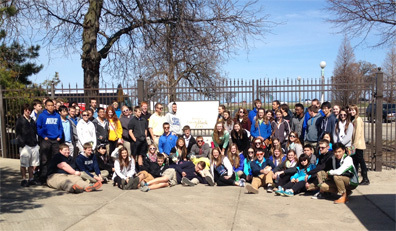 It was a great Earth Day, with some cool Chemistry. The team of water testers. Has your ChemClub tested local water? How do your results compare?